Shutter Tours is a top rated sightseeing tour company in Seattle based on traveler reviews. 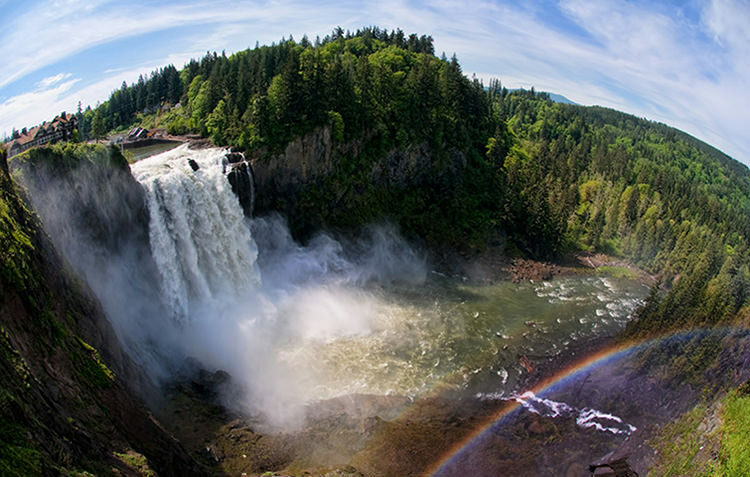 We offer daily sightseeing tours of not only Seattle, but we also include the majestic Snoqualmie Falls on our four-hour trip. Your fully narrated tour by professional tour guides will help you learn about the history of Seattle, and you’ll enjoy stops that include beautiful views of the city at Kerry Park, also known as the Frasier View. Our buses are custom coaches seating no more than 14 people, and we provide water and snacks on tour for your comfort at no additional charge. As a bonus, our guides also provide you with simple photo tips to help you take better travel photos. Even if you only travel with your phone, these tips will help create the best travel memories. The month of April we offer Tulip Festival Tours to Mt. Vernon, Washington. This is your opportunity to see see millions of tulips in bloom. We also offer custom group tours to Mt. Rainier, wineries, and anywhere else you may want to go in the Seattle area. You are submitting a booking enquiry. Shutter Tours will then contact you by email with details of availability and prices.